Print your logo onto these custom printed metal teardrop mobile phone ring /stand holders or one of our other innovative mobile phone accessories and use them in your next marketing campaign as a unique giveaway item. Our tear drop shaped premium mobile phone rings double up as kickstands to hold your phone upright. The design is patented and ideal for upmarket promotions. The mobile phone rings are designed to help hold mobile phones whilst walking and avoid dropping them. These mobile phone rings are suited for iPhones, Samsung’s, and almost every model of mobile phone. The mobile phone ring allows you to hold your mobile phone on your finger like a designer ring or use it as an adjustable mobile phone stand when watching videos. Perfect for any lifestyle promotion - Ideal for any fashion or cosmetic related promo! Prices below include a 1 colour print/engrave in 1 position. Other innovative corporate gift ideas that could be suitable to create brand awareness include these cheap promotional Double Phone Stands, quirky advertising gifts such as these Custom Shaped Mobile Phone Ring/Stand Holders or how about using one of our more bespoke custom made products such as these great quality Athletic Mobile Phone Ring/Stand Holders? Custom brand these vulcan wireless phone chargers or one of our best-selling promotional mobile phone accessories with your company logo! Engraving your logo on the promotional metal teardrop mobile phone ring /stand holders is usually done by Laser engraving, where the laser removes a thin layer of the metal surface. Your logo becomes part of the metal teardrop mobile phone ring /stand holders and is impossible to remove. Sometimes the engraved effect will be a different metal colour to the outside metal coating of your product. We can also engrave wood or plastic. Engraving is usually a more expensive branding method. Personalise your metal teardrop mobile phone ring /stand holders or custom design mobile phone accessories for your marketing campaign. 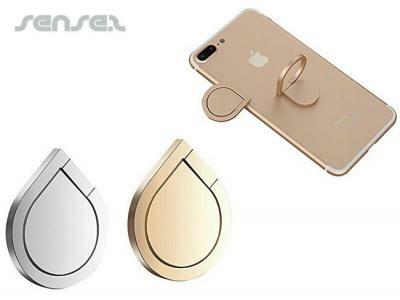 How can these unique promotional metal teardrop mobile phone ring /stand holders or our personalised mobile phone accessories fit in with your marketing strategy and help you maximise your brand exposure? Our custom made Metal Teardrop Mobile Phone Ring /Stand Holders can be produced from a minimum quantity of 1000 pieces. We can have your logo branded on these corporate Metal Teardrop Mobile Phone Ring /Stand Holders in Engraved or 1 Colour Pad Print. A setup fee of NZ$191.00 will apply to make the film.